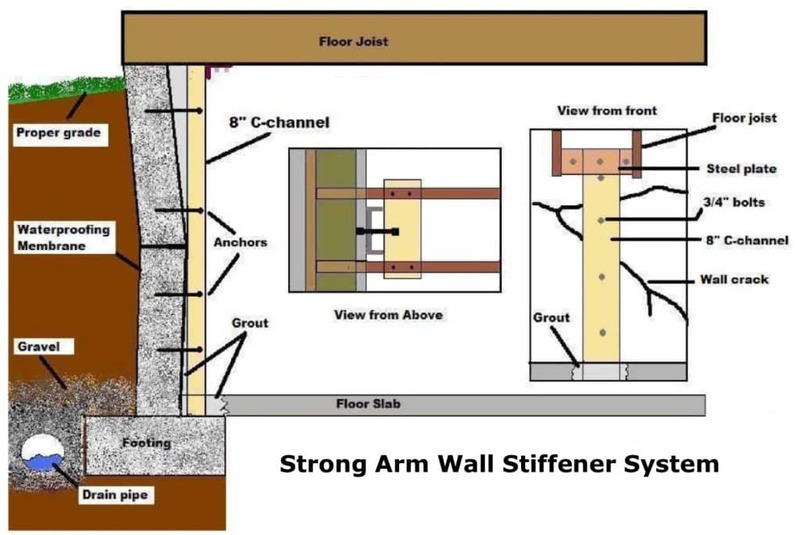 Foundation walls can move “laterally” which means to lean or bow during the seasonal changes here in the Midwest. Walls typically move inward during times when the soil is saturated from rain and then move back out during the dry season. In many cases the walls will not move out or “recover” as much as they moved in and you end up with a lean or even a bow in your wall. General rules for repairing wall movement are based on the amount of movement, type of movement, and the way the structure is built. Wall lean or bowing less than 1″: The wall can recover on its own, do preventative maintenance like dirt, gutter drains, and concrete leveling. Wall lean more than 1″: The wall will no longer recover on its own, brace the wall using recommended I-beam and re bond all wall cracks. 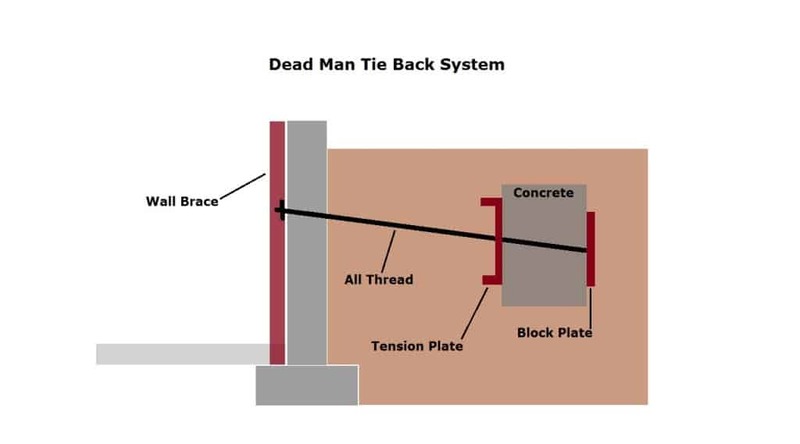 Wall bowing more than 1″: The wall will no longer recover on its own, brace the wall using a Wall Stiffener or Dead Man system. Any wall leaning or bowing more than 1″ on a home that is Egress (walk out) on the opposing wall will require a Dead Man system. 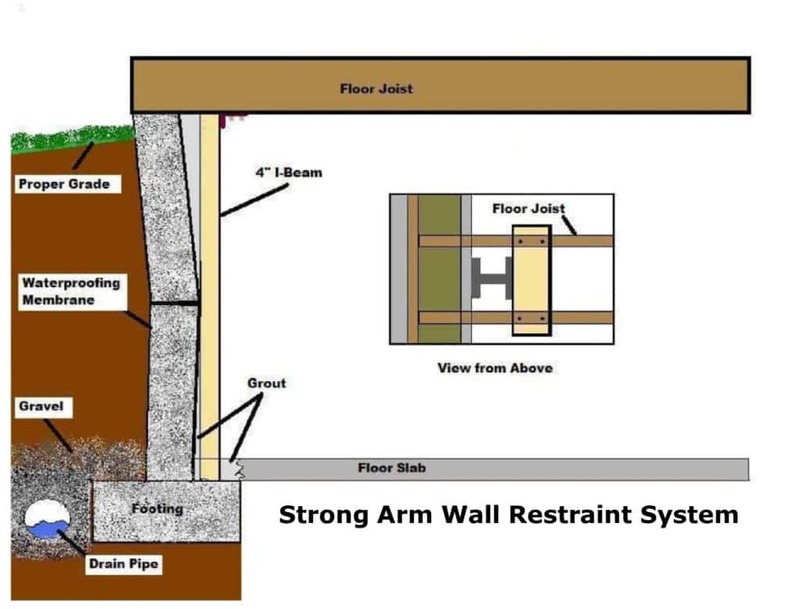 Foundation 1 has established itself as one of the top wall stabilization and restraint companies in the Midwest. Whether your wall is bowing, leaning, or displaced, we can repair and regain the integrity of your foundation. Call today or fill out the form on this page to get you free consultation. We work on all foundation types including poured concrete, cinder block, and stone / masonry. We have a number of wall straightening techniques to work in these different circumstances, from basic approaches up to complex full wall rebuilds. Click here to see some recent job site photos.